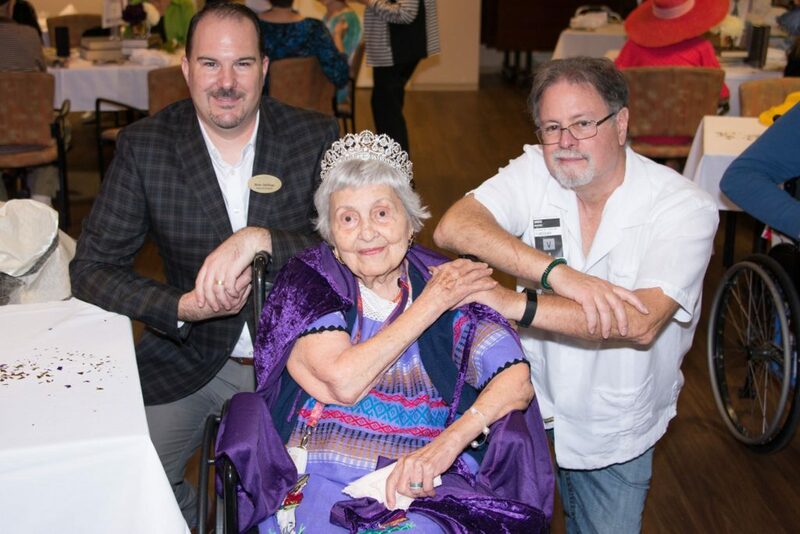 Family, friends and guests adorned in fancy hats will attend festivities scheduled for 10:30 – 11:30 a.m. on Oct. 2 at Belmont Village Senior Living, 13850 N. Frank Lloyd Boulevard in Scottsdale. The crystal tea will include a crown cupcake tower, her favorite, Frango mints and tea sandwiches. A Royal enthusiast, Ms. Riccio has a picture of herself with Queen Elizabeth during a past tea outing. The great grandmother of three said she is excited about the possibility of her first great grandson being born on her birthday. Born in Chicago, Ms. Riccio was one of two daughters, who excelled and loved school so much that she graduated first in her class in high school. She earned straight A’s in English at Teachers College and the University of Illinois. For 35 years, Ms. Riccio taught fourth through seventh grades in the Chicago public schools, the release detailed. She moved to Arizona with her husband when his health declined and brought her love of books and music. She contributed her time in the local community as a member of the St. Patrick’s choir for 30 years, a member of the community chorus for 10 years and a volunteer at Scottsdale’s Public Library for 17 years, the release stated. To read the complete article, visit the Scottsdale Independent.